- Perfects skin tone and texture leaving a dewy hydrated finish. When I received this foundation I wasn't very hopeful that it would be any good. I mean it's not like David Jones are known for their makeup creating skills - they are only a department store after all. But I'm all for trying out new things so on it went. Even though its called a cream foundation it is in fact a liquid foundation and I wouldn't say it had a creamy consistency at all. The colour I have is Fair and it's more of a yellow toned foundation which I prefer to use to balance out the pink in my skin. The first thing I loved about this foundation is that it was really easy to apply, it blends in really well and sits perfectly on the skin with the perfect balance between dewy and matte. The coverage is medium and after applying the foundation with my Beauty Blender I set it with a small amount of powder. It feels really comfortable on the skin, doesn't stick to any dry patches and doesn't make me feel like I'm wearing a face mask (Revlon Colorsay and Estee Lauder Double Wear I'm looking at you). I've been wearing this to work everyday and find it lasts the full day with a small amount of wear and shine on the usual suspects; my nose and forehead. Two bonus points for me are that it's Made in Australia and it also has an SPF of 15 which isn't really high but is better than none at all. My skin is normal to dry and my days of blemishes are thankfully over but if you had oilier skin and/or blemishes you would probably still need a concealer and maybe a heavier mattifying powder over this foundation. Overall I have been pleasantly surprised by this foundation and it's been my go-to foundation for the last couple of months. If I didn't have a heap of other foundations to get through I would definitely repurchase. 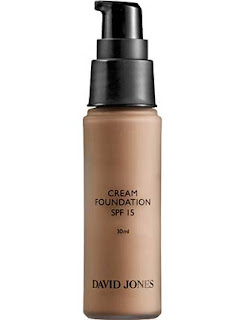 This foundation retails for $22.95 and can be bought in David Jones Stores in Australia or from their online store. Have you tried any products from the David Jones Beauty range before? P.S: Don't forget Imminent Beauty is now on Facebook. Like the page to keep updated on the blog and be the first to know about a giveaway I'll be hosting soon. It's pretty reasonable isn't it. I haven't tried anything else of theirs but I'd be pretty keen to after this win! I liked the foundation too Kayte, you should try some of their eye shadow palettes next they are not bad either. I got the powder in my sample bag and I like it too!